I personally hated the idea of relying on a wheelchair following an unexpected disability. Imagine the situation where you suddenly feel like a second-class citizen no longer able to participate in day-to-day life like “all” others. Technology has achieved miracles in the past and those stories have not come to an end; quite the opposite in fact. In the last few years gadgets like self-balancing scooters and hoverboards have seen increased popularity, especially with the younger generation. 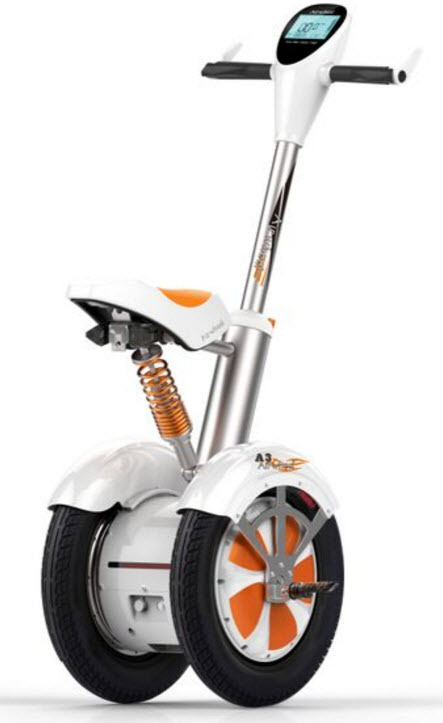 I looked around to see what new innovations exist that might benefit and appeal to me and found a seatable self-balancing scooter. This has tremendous advantages over the older and more traditional aid vehicles like electric scooters and wheelchairs. The biggest positive impact is mental: the user is suddenly perceived as “cool” and someone that people want to engage with more. They are no longer treated so much like a handicapped person that most don’t know how to approach. In addition, the user feels more involved with others due to the sitting level being higher and this making it much easier to be included in conversations with people that are standing, as opposed to always being much lower. Another great advantage is the ability go almost everywhere that is possible by walking: nature trails, etc where it is simply not possible to go with traditional aid vehicles unless someone else is there to assist. Today there is a huge amount of talk around “connected vehicles” which quite often means connected and perhaps self-driving cars or even bigger things like self-sailing cargo ships. A digital world is run by the real-time connection of people, processes, data, and “things” (devices/sensors). We are already seeing “connected cities”, “connected farms” and “connected health” but this is just the beginning. There is so much more that can be connected, for example, pedestrians, cyclists, even the moose in the forest running towards the highway, and why not wheelchairs and other types of aid vehicles too? All connected things are generating tremendous amounts of data but this data means nothing until you connect it to intelligent and intuitive processes. You typically need to leverage predictive capabilities to get the most out of this data and discover insights that really matter and ultimately help serve people better and potentially even save lives. A disabled person driving a next-generation aid vehicle could become so happy of their new capability (that allows them to explore the world much as they used to) that this could, in some cases, become a hazard due to their excitement or confidence pushing them beyond their capability to control the vehicle. It is often all too easy to forget to listen to our own body whilst remaining aware of things in the surrounding world. The big challenge is to recognise what signals are relevant to predict unwanted consequence and somehow cool down this behavior by warning the person early enough. It is not always easy to know what data is relevant to achieve this and therefore all data should be stored to allow reference cases to be run against ever increasing amounts historical data, in order to find the relevant algorithm and data pattern to prevent the same unwanted situations occurring again and again. Should the worst happen, whereby a user has an accident and gets badly injured, it would be crucial to automatically alert the right medical resource, e.g. ambulance service, with the correct location and information of the person and their condition. Another use case that comes to mind is preventing all kinds of collisions that might cause significant loss or cost to society. One example of this would be a person walking, another cycling and to be able to deliver that crucial speed difference information to self-driving cars so that they know what to expect at the next corner and avoid a potential accident. I am sure there is a demand for device independent solutions like those above and much more. Solutions are needed that combine all kinds tracking of moving objects and predict possible consequences of unwanted behavior in real-time. Data can be collected today in massive scale and technology and software platforms exist that can harness this data to make such scenarios a reality. I was originally thinking about this subject from the perspective of a disabled person, however the same type of solutions could be used anywhere, for example, the world of sport where athletes/players can achieve better performance through analysis and insights from previous training/games. Sensors would generate the data but the intelligence comes from the knowledge of what data is relevant for the specific purpose. Going back to the wheelchair scenario, it is crucial to get warnings early enough to be able to slow the speed. As for self-sailing cargo ships, these would need to be aware of how pitching of the boat affects the speed, and so on. It’s critical that we question the continued adding of non-integrated one-off solutions. Instead, we should take a step back and establish a true digital business framework, a common technology platform that brings together all business processes (BP) and analytics via business intelligence (BI). With a single data view providing one version of the truth you will be able to turn data into “live” actionable information, as business is happening, which allows everything to be instantly responsive and corrective actions to be taken based on actual performance. No matter what your industry or solution area is you should start thinking BIG to provide something even more valuable to your customers – if you don’t, your competition likely will. I can see predictive capabilities being one of the most important things to embed everywhere so as to provide insights as to what might happen or the best thing that could happen. SAP Cloud Platform is a natural choice for a common platform to build a solution as it combines both in-memory transactional processing and analytics along with embedded predictive engines and an application engine – all of this in a single cloud platform really simplifies the landscape in a new modern way. For you as an OEM partner you can build ideas in a single and robust platform that enables you to continue your innovations without the need to integrate additional technologies. In addition, SAP Cloud Platform can access and consume core and complementary data sources from anywhere and at any time or frequency. Coming back to the original topic, I have been dreaming of a solution that tracks my balance, dysfunctions, heartbeat, my wheelchair behavior and what correlates with what. It would be ideal if the same solution could give me warnings of intersecting traffic around the corner to avoid accidents and associated injuries. In the worst case, should an accident and injury occur, the same information could be used to better understand what happened and provide the most appropriate treatment and service to get back on track again. Thank you for taking the time to read this blog post. Please feel free to add comments or ask questions below. Should you want to discuss or find out more about how you can partner with SAP to embed SAP technology into your own products please feel free to contact me – and I will direct you to the relevant regional OEM team. I think it’s a great post – definitely opened my eyes to how technology can help (and warned about how it can hurt). Society indeed has challenges being open and inclusive but it is also full of people who also want to address and enable — and it’s pieces like this that can help inspire tech – and society – to do more. Thanks Jaakko for contributing! I hope to see more from you about tech’s role. Jaakko, very good article !! Inspiring stuff! Thanks for sharing Jaakko.